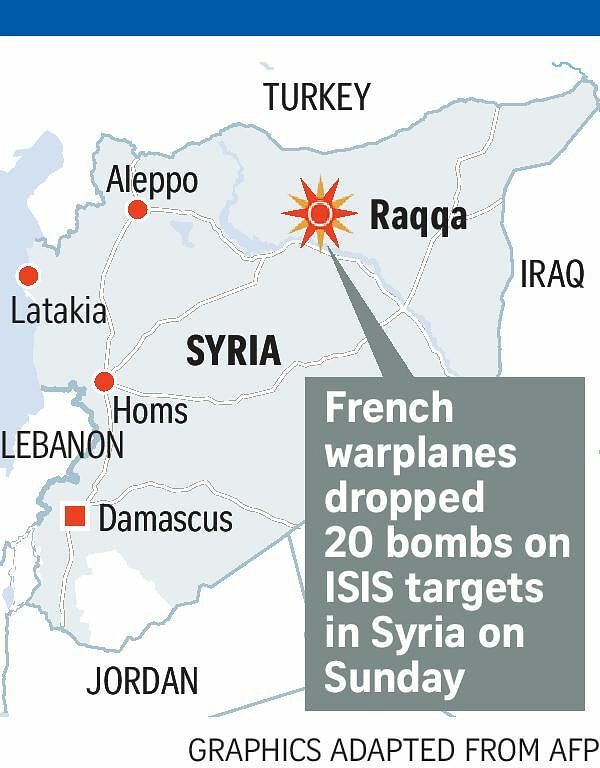 PARIS • France bombed the Syrian city of Raqqa on Sunday night, its most aggressive strike against the Islamic State in Iraq and Syria (ISIS) group it blames for killing 129 people in a string of terrorist attacks across Paris only two days before. President Francois Hollande, who vowed to be "unforgiving with the barbarians" of the ISIS after the carnage in Paris, decided on the air strikes in a meeting with his national security team on Saturday, officials said. While France has been conducting scores of air strikes against ISIS in Iraq, it had been bombing inside Syria only sparingly, wary of inadvertently strengthening the hand of President Bashar al-Assad by killing his enemies. But after militants with AK-47s and suicide vests shattered the peaceful revelry of Paris on Friday night, killing dozens of civilians in restaurants and at a concert hall, France seemed intent on sending a clear message of its determination to curb ISIS and the group's ability to carry out attacks outside the territory it controls. The French Defence Ministry said in a statement that the air raid, coordinated with US forces, was led by 12 French aircraft, including 10 fighter jets, and had destroyed two ISIS targets in Raqqa, the radical group's self-proclaimed capital. The United States provided French officials with information to help them strike ISIS targets in Syria, known as "strike packages", US officials said. The French air strikes on Raqqa began at 7.50pm Paris time, first taking aim at an ISIS "command post, jihadist recruitment centre and weapons and ammunition depot", the Defence Ministry said. The second target, it said, was a "terrorist training camp". Warplanes continued to hover over the city close to midnight, according to residents and activist groups. Residents have seen the city bombed by Syrian, US and Russian warplanes. They have been terrorised by public executions by ISIS. Now they are wary of yet another power arriving to pummel the city. Mr Khaled al-Homsi, an anti-government activist from Palmyra, who uses a nom de guerre for his safety and is the nephew of an archaeologist who was beheaded by ISIS fighters, issued a plea on Twitter to France, saying not all the city's residents were ISIS militants and urging caution for the safety of civilians. Meanwhile, the US military said 116 fuel trucks used by ISIS had been destroyed in a single air strike on Sunday near Albu Kamal, an ISIS-held town in Deir Ezzor province along Syria's border with Iraq. ISIS reportedly makes millions of dollars in revenue from oil fields under its control, and the US-led coalition has regularly targeted oil infrastructure held by the group.